Last month we discussed bonding systems and the role they play in minimizing the likelihood of stray current and galvanic corrosion. 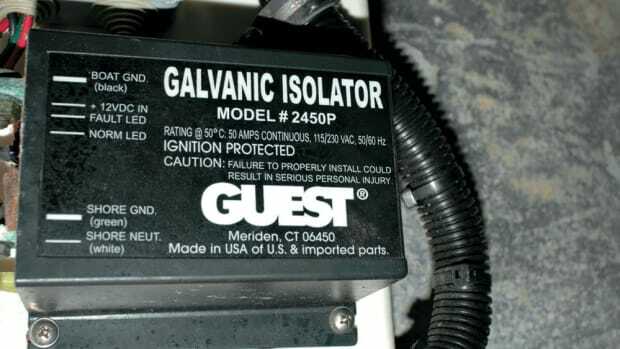 This month well look at the role galvanic isolators play in this process and Ill offer tips on anode selection and installation. As a refresher, stray current corrosion is nearly always the result of DC current that is leaking into bilge water or underwater metals. Its especially destructive in that it typically causes severe damage very rapidly, often in a matter of days or weeks. Galvanic corrosion, on the other hand, while also DC in nature, is much slower and more insidious, taking months or years to do its dirty work.In either case, a sound bonding system and anodic protection (installing and maintaining zinc or other alloy anodes) are key elements in the defense against both types of corrosion. Remember, anodes are any sacrificial metal installed on your hull, running gear, or inside your engine that are used to prevent corrosion. They can be made of zinc, aluminum, or magnesium, and for that reason they are properly referred to as anodes rather than zincs, although the vast majority of anodes are, in fact, zinc. All zincs are anodes, but not all anodes are zinc. Last month I also discussed the uneven consumption of the transom-mounted anodes on PMMs test vessel. Such uneven consumption is often indicative of a problem in the vessels bonding system or the installation of the anodes themselves. In this case, the problem, investigated at my request by Marine Technical Services (MTS), www.gomts.net, turned out to be poor contact between the anode and the mounting stud. This scenario is exceptionally common and its symptoms, uneven or no consumption of anodes, should not be ignored. For anodes mounted to the hull, you should carefully inspect the studs themselves as well as the wiring that is attached to them inside the vessel. The external portion should be clean and free of any scale or marine growth. If necessary, remove the anodes and clean the hardware using emery cloth or a stainless-steel or bronze wire brush (avoid using an ordinary steel-wire brush as it will leave behind steel deposits that will rust). Make certain fasteners used to hold anodes in place are secure and complete. That is, ensure that lock washersand, if necessary, washersare used and that they are installed in the correct order. The lock washer should always rest directly under the nut. For anodes installed over other hardware, such as rudders, propeller shafts, and trim tabs, make certain the surface has been thoroughly cleaned before installing a new anode. Often, this cleaning is accomplished with emery cloth or bronze wool. If the anode is installed over a surface that is contaminated with scale, paint, or other debris, then the protection the anode provides will be compromised. Its important to note as well that anodes that last an unusually long time are suspect. When an anode is consumed its doing its job, its providing protection to the metal(s) to which its connected. Once installed, if you are able to use an ohmmeter, you can check your installation and the soundness of the bonding system by connecting one lead to the anode and the other to a bonded underwater metala through-hull fitting, strut, or rudder, for instance (you may need to make extra-long leads to perform this test). The resistance between any two bonded underwater metals and between any metals and an anode should not exceed one ohm. If it does, then the hull anode is ether not making good contact with its mounting studs or the bonding system wiring is compromised by corrosion or a loose connection, etc. As mentioned above, anodes come in different alloysaluminum, magnesium, and, of course, zinc. Traditionally, fiberglass vessels operating in sea water have used zinc because it provides more than adequate protection for common underwater metals such as stainless steel and bronze. Zinc anodes are less effective in fresh water or brackish water. The relative energy capacity of zinc is 368 amp hours per pound with a voltage of -1,050 millivolts (in corrosion-speak, the more negative, the better). Remember those numbers. Aluminum anodes, on the other hand, have several advantages. They are well suited for use in sea water as well as brackish and fresh water. Thus, if you find yourself transiting these water types, then aluminum anodes make the most sense. Aluminum anodes also pack more of a punch and they last longer than zinc anodes of the same weight. Their relative energy capacity is 1,108 amp hours per pound, significantly more than zinc, with a voltage of -1,100 millivolts. If you opt for aluminum anodes, be sure that the change is universal for all anodes used within the same bonding system. Surprisingly, aluminum anodes are often no more costly than their zinc brethren, offering a free lunch of sorts. Magnesium, on the other hand, is an alloy that is reserved primarily for use in fresh water. If thats the only place you operate your boat, then consider using this as your anode material. Whichever anode material you select, be certain it carries a military specification approval. Doing so will ensure, among other things, that it is free of an excessive amount of other trace metals that offer no corrosion protection. For more information on anode use and selection, see http://boatzincs.com/pdfs/Chart_B-Which_Anodes_Should_I_Use.pdf. Inspect your anodes periodically. They should be eroding relatively evenly, particularly those that are the same size. The rate at which they are consumed is a function of how much metal they are protecting and the size of the anode. If your anodes appear to remain unchanged and last forever, somethings probably wrong. If, on the other hand, they are consumed very rapidly or the rate at which they are being consumed increases, then dont ignore this symptom, its probably telling you something is wrong with the system. Once the anodes are gone, the next least-noble metaloften your propeller­will take its place by corroding away in much the same way the anode did. Even if your bonding systems and anodes are in top working condition, its possible that your vessel will still suffer from either rapid anode consumption, or worse, corrosion of underwater metals. If youre doing everything right but are still suffering from corrosion issues, the culprit in this scenario is the shorepower cable. Note, I said shorepower cable and not shorepower. One of the conductors in the shorepower cable is a green wire called the safety ground. This extremely important wire ensures that a shorepower fault aboard your boat will be safely carried to ground; without it, or if its installed incorrectly or in poor repair, you could suffer a fire or electrocution. This wire is by necessity connected to your vessels bonding system, and through it, to your anodes. Whenever you plug into shorepower you are often unknowingly connecting your bonding system and anodes to all of the other vessels on your dock, and their underwater metals and anodes. Doing so often means that your anodes could be protecting the underwater metals of the vessel in the slip next to or across from you, especially if that vessels anodes are depleted. This is a simple case of galvanic corrosion and it has nothing to do with the shorepower itself, its simply a tie connection that is made via the shorepower cable and its green safety ground wire. Even if you turn the shorepower off, the green ground wire remains connected whenever the shorepower cable is plugged in to both your boat and the dock pedestal. As long as its connected, destructive galvanic current can flow through this medium. There are two possible solutions to this problem. The first is simple and its free. Simply unplug your shorepower cable whenever its not being used. If you are able to leave your vessel unplugged, good for you, and the problem is solved. In most cases, however, thats simply not practical. Folks want to leave their vessels plugged in to keep refrigeration, HVAC systems, and battery chargers running (to keep a bilge pump running in the event of a leak if nothing else). The other alternative involves the installation of a device known as a galvanic isolator. Galvanic isolators block DC voltage, thats the kind that causes corrosion, while allowing AC voltage, including the all-too-important shorepower faults, to pass. Blocking DC voltage means that when you plug into shorepower your vessel is now isolated from other vessels AC grounds and bonding systems. Youre no longer protecting your slip neighbors boat that hasnt had its anodes changed in two years. Fortunately, the PMM test vessel was equipped with a galvanic isolator (two actually, one for each shorepower service). Because of the rate of consumption of the vessels anodes, we wanted to be certain that they were installed and operating correctly. Once again, MTS took on the challenge. They inspected the installation and confirmed that the isolators were installed in accordance with ABYC Standard A-28, Galvanic Isolators. Then, using the diode test function of a digital multimeter, an MTS technician went on to test the isolators to confirm that they were blocking DC voltage and otherwise operating correctly. A failsafe design that ensures that even in the event of a catastrophic internal fault or a lightning strike, the isolator will still safely and reliably conduct AC fault current to ground (even though it may no longer isolate galvanic current). Full compliance with ABYC Standard A-28 Galvanic Isolators, most recently revised as of July 2008. To view a sampling of galvanic isolator suppliers, visit http://www.pmariner.com, http://www.dairyland.com, and http://www.marinco.com.